The Explore Scientific PMC-Eight ExploreStars Android Application connects an Explore Scientific PMC-Eight equipped telescope to the universe with any Android Tablet Running KitKat or later. External storage, such as MicroSD is required. This platform is designed to simplify the stargazing experience through it’s simple and intuitive interface. ExploreStars has the same basic functions found in other GOTO telescope systems, with an important exception, the app and the command language driving the PMC-Eight is open source – meaning anyone can modify the software or create their own software through an available Software Developers Kit (SDK) – and you can download your modified software onto its electronics. The app offers classic four-button pattern for guiding, centering, moving and slewing on the touch screen of your tablet or phone. There are Selectable and User Enterable GoTo, Slewing, Centering and Guiding Rate as well as standard 1-star, 2-star alignment and 3-star alignment functions. It also provides Sidereal, King, Lunar, Solar, and user defined tracking rates; Synchronize function; Search function; Coordinate input; Custom mount support using enterable stepper count scaling; Polar Axis Correction and more. For stellar objects, the app uses the Hipparcos/Tycho II database. Where possible, Explore Scientific has cross-referenced the Bayer, Flamstead, SAO, HD/Harvard, DM, BD/CD/CPD, and GSC catalogs. The user can search by any of these designations to find a given star. When the system first starts, it loads the 2,000+ stars of magnitude 5.5 and brighter. The user can load the additional 72,000+ star catalog as needed. 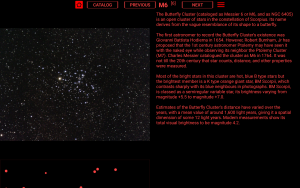 For non-stellar objects, the app uses the RNGC/IC catalog. The system is designed so the user can update the provided catalogs and create their own catalog using tables and scripts in Microsoft Access. Also, each object has a unique ID number, so users can report errors and omissions. To start using ExploreStars, download the free app and also download the celestial data set that contains the astronomical catalogs, reference images, and reference text. Simply by unzipping the ExploreStars folder containing the expanded celestial data set into your Pictures directory, you will expand the native database from a thousand objects to over seventy thousand objects. The source code for ExploreStars is also available for programmers on the OpenGOTO Community to serve as a demonstration platform for those who wish to create their own Astronomy GOTO or Motion Control software for the Explore Scientific PMC-Eight.